How to get there: We parked on a turnout about 6km along the (toll) road that runs from highway 55 (Sognefjellsveien) into Leirdalen, this road leads to the famous mountain hut Leirvassbu. Parking is just after the crossing of a river that comes down from the left, also just after the Geitsætri building on your left. There is a fence that runs perpendicular to the road on the left hand side as well. Route description: The route starts out along the fence until it ends, then continues on a quite visible trail up the first hill. The river runs on the left side as you hike from the road. After crossing the first hill, one observes that the river forks. Descend and find a safe crossing of the right fork. In May there are snow bridges, later in the season this crossing should be done with care. Continue up the slope called Skardbakken until about 1450 meter of elevation, at this point the slope down to the river N. Illåi becomes less steep and one can contour into the valley. Eventually, cross the river and proceed up the valley to the Nordre Illåbreen glacier. The south-west slopes of Skardstind (2373 m) looms overhead on your left. Follow the left (north) side of the glacier and climb more steeply north between Skardstind and Ymelstind to the col Illåbandet (approx. 2100 m). The glacier that starts at Illåbandet is Storgjuvbreen. The mountain Storgjuvtinden is now on your right. There is a ridge running from its summit connecting it with the unranked peak Ymelstind. 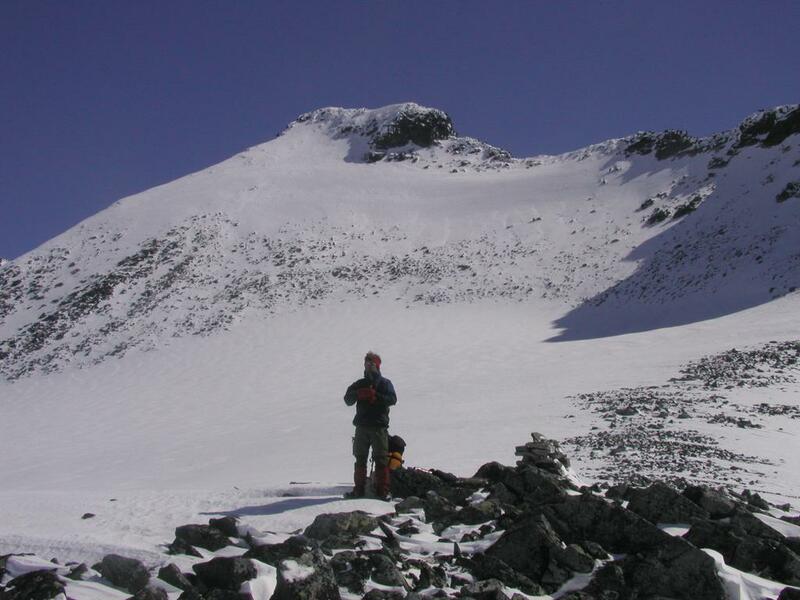 We proceeded to climb diagonally across the west face of the mountain, in the beginning among rocks, later on a large unbroken snow slope until we hit the north-west ridge jsut below the final summit cliffs. 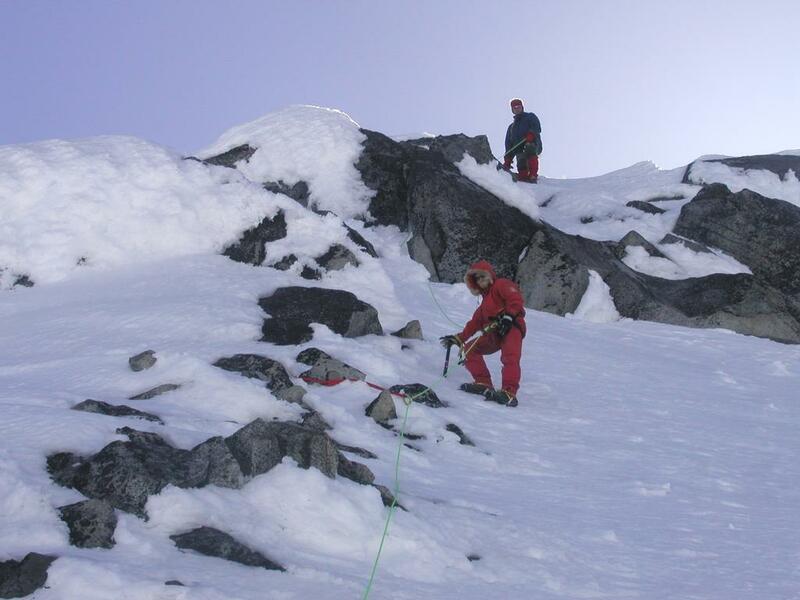 From this point a short (YDS) class 3 scramble up a narrow crack leads directly to the summit. Later in the season, when most of the snow has melted, there may be many more variations. 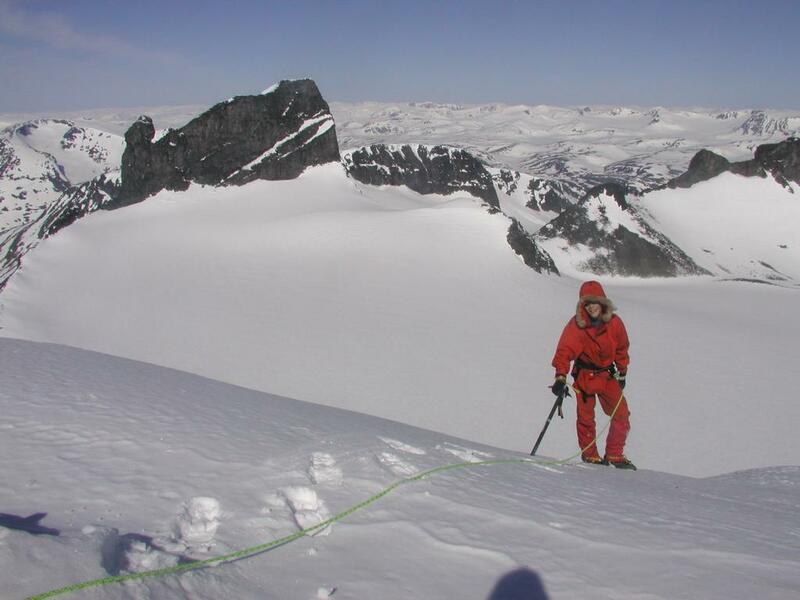 Comments: I did this climb with my son Pål Jørgen, age 13 and my friend Arnt Flatmo. We camped at llåbandet and climbed the slope in the early morning before any sunshine would ruin the good, frozen snow. The entire climb, including a nice stay at the summit took less than two hours round trip from the tent. Storgjuvtinden, 2344 meter, our route would ascend diagonally to the skyline just below the final rocks, then follow the ridge to the summit. Pål Jørgen near the summit of Storgjuvtinden. 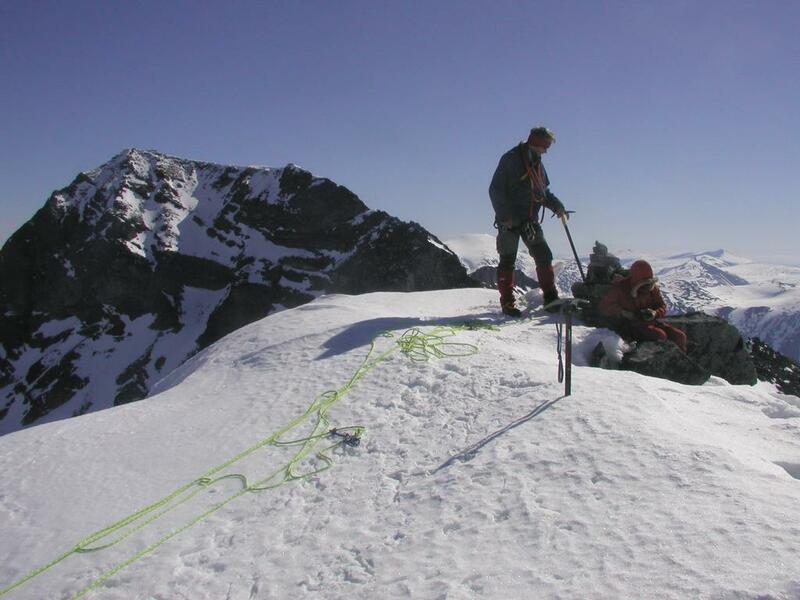 On the summit, Galdhøpiggen looms behind. The upper part of the descent.